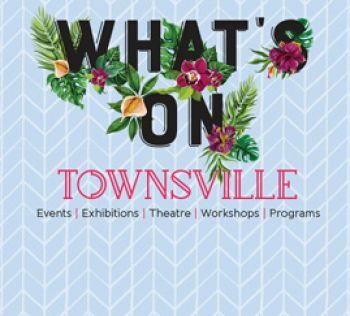 The City of Townsville Art Collection offers compelling views, narratives and ideas of life in “the Tropics”, whilst revealing the individuals and forces which have shaped Townsville’s long and colourful history. Some of the works include Indigenous land, colonial settlement, Townsville port, World War II staging posts through to the modern military base and contemporary tropical city. The permanent collection holds more than 2,700 works of art. The multicultural collection touches Australian Indigenous, European, Melanesian and other world cultures and is both contemporary and historic. The major focus of the collection is on art from North Queensland and the pacific, featuring artists like William Westall, Jakupo Ako and Ken Thaiday. Some of the rich treasures that the council holds for present and future generations are on display in council and other city buildings and are often displayed in the galleries collection exhibitions. Both individual and themed shows are exhibited at both the Perc Tucker Regional Gallery and Pinnacles Gallery throughout the year. The galleries' strong connection to the community has had a positive impact on the development of the collection, shaped by many artists, collectors, supporters, Councillors and gallery staff. More than 55 per cent of the collection (around 1,500 works) is comprised of art works donated by, or purchased with funding assistance from corporate or private donors (often Townsville collectors looking for a permanent home for their art works) where the works will be appreciated, cared for, and put on display for others to enjoy. These donations are not limited to local art works and include contemporary and historic Australian, Pacific, European and American art works, reflecting the multicultural Townsville community. Artists have also donated their own and others work, such as the prominent Australian (Townsville-based) artist, Tate Adams. He has gifted around 250 high quality works including artists such as John Brack and George Baldessin. It is because of this generosity of donors that Townsville City Council can be a leading regional collecting institution in Australia. The collection is often called upon by other Australian institutions to support books and exhibitions, and has been an important resource to support classroom study by James Cook University, TAFE and secondary school students in Townsville. Townsville City Council’s art galleries continue to be a gathering place for all those seeking to share the beauty of this exciting collection of world art. The collection is at the heart of the council’s efforts to engage, educate and enrich the diverse populations drawn to the Townsville region.